Give your unwanted items a new home in your community. Do you have items which are too good to throw away? It’s quick, easy and free to pass on your items and you may not even need to leave home. In Essex we’re lucky to have many reuse organisations to choose from. If you are having a clear out, there are lots of easy ways to pass items on to other people. More and more of us are donating and purchasing items from reuse organisations meaning you are supporting local people and great local community causes while passing on your unwanted items. Many reuse organisations will even collect from your own home – no need to leave the house! Local charity shops are always happy to accept good quality donations as this helps raise money for good causes. Freegle is an online platform to help people give items for free in your local community. The types of items you can give and get on Freegle ranges from furniture, clothing and children’s toys to soil, rubble or even pre-loved garden ornaments. You can pass almost anything on using Freegle! You can even sell good quality items through popular selling websites, or jumble sales and car boots. This is a great way to clear out the house and make a bit of money while doing so. Passing on your old items is a hassle-free way of doing good in your community. Visit www.loveessex.org to find out more. Passing on your old items is a hassle-free way of doing good in your community. 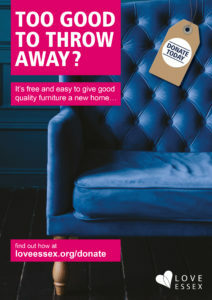 Visit www.loveessex.org/donate to find out more. Posted on January 15, 2019 January 15, 2019 Author PPotterCategories News and AnnouncementsLeave a comment on Too Good to Throw Away?